For lifting weight overhead you need powerful shoulders. And for this movement no exercise prepares you better than the shoulder press (also called as overhead press). For this exercise, I recommend using dumbbells to start with as free weight. Using dumbbells instead of a barbell increases your range of motion. It makes sure that each side of your body gets opportunity to grow equally strong. The reason is: With dumbbells you can’t just depend on one shoulder to push up the weight. 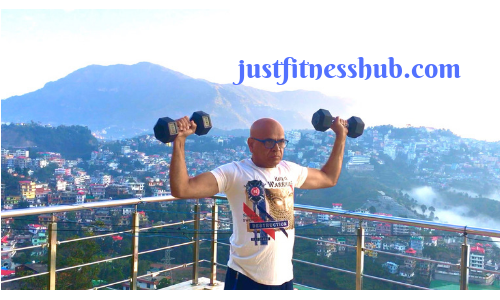 In this article, you will find how to do Standing Overhead Dumbbell Press (also known as Dumbbell Shoulder Press) properly. This is a beginner’s level strength exercise that mainly works on your shoulders. Note: The standing overhead dumbbell press can be done unilaterally (using one arm at a time), or bilaterally (using both arms together). In case you prefer one-arm version, you can either alternate arms or do all the reps for one arm and then do the same number of reps with the other arm. How To Do Dumbbell Shoulder Press Correctly? Start Position: Stand with your feet shoulder width apart, knees locked and glutes & abs contracted. Take a dumbbell in each hand, lift the dumbbells to head height, the elbows out and about 90 degrees & palms facing forward. This will be your starting position. Movement: While maintaining your low back straight with no leg drive or leaning back, raise both dumbbells together directly above your head until your arms are fully extended, elbows locked and the dumbbells almost touch overhead. Pause, and return the dumbbells down to the starting position in slow and controlled motion. This completes one rep. Do desired number of reps.
(i) Maintain your glutes and abs contracted as you raise the weight overhead in order to prevent your lower back from rounding excessively. (ii) At top of the exercise, that is when you are holding the dumbbells overhead, make sure your body forms one straight column all through from your feet to the hand. (iii) Maintain your head and neck straight by looking straight in front of you all through the movement. (iv) Breath in through your nose while you are bringing the weight down, then breathe out forcefully from your mouth as you press the weight overhead. (i) Leaning Backward And Rounding Low Back: It’s the most common mistake, which the beginners make while pressing the weight up – whether it’s a dumbbell, barbell or kettlebell. When you don’t have enough shoulder flexibility or you use a weight that’s too heavy, you tend to compensate by arching your lower back excessively. This bad form put your back in a compromised position and can cause serious back injuries over time. Useful Related Post: How Much Weight Should You Lift? (ii) Not Locking Out Your Arms: While pressing weight overhead, you should lock out your arm at the top of the press. Ideally your upper arms should be right next to your ears and in vertical position. (iii) Leaning Sideways To Press The Weight Overhead: Working out with dumbbells is a good idea as it helps to correct muscle imbalances between the right and left sides of the body. But then one should maintain one’s body upright and strong, so as not to sway from side to side or lean over side to side as the dumbbells are raised above the head.